Origins and meaning of WWI - ZineWiki - the history and culture of zines, independent media and the small press. Origins and meaning of WWI is a 24 page zine presenting an essay by John Zerzan which also appears in his book Elements of Refusal. 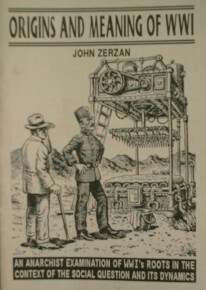 Zerzan is a anarcho-primitivist and takes the view that World War One was more or less the means by which the growing power of revolutionary movements in Western Europe was stamped out. The back cover states that 'War is the health of the state'. This page was last modified on 2 March 2008, at 01:26.